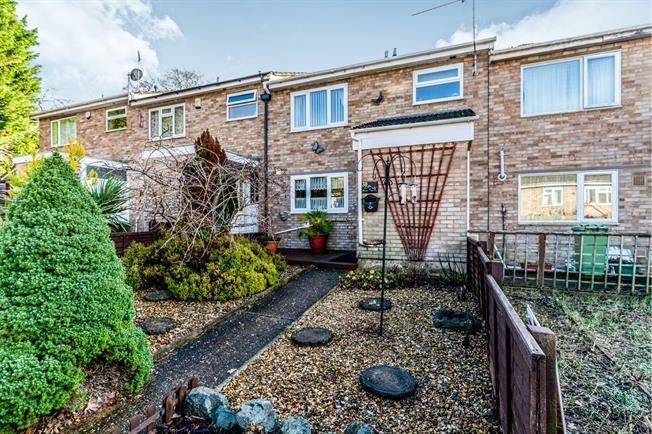 3 Bedroom Terraced House For Sale in Milton Keynes for Offers Over £245,000. An immaculately presented, three bedroom property within a stones throw of the grand union canal comprises of entrance porch with built in storage, downstairs cloakroom, well presented fitted kitchen. Lounge diner and conservatory to private rear garden with synthetic grass.. Upstairs the property has three spacious bedrooms with newly fitted shower room. The property also benefits from gas central heating and double glazing. This property also has a allocated car port. This property is unique in the sense it has ten paid for solar panels to helps to save on utility bills. Built in fridge freezer, space for dish washer, tumble dryer and washing machine. Good amounts of low level and eye level storage cupboards and draws. Bowl sink with drainer, built in double electric oven with built in gas hob. Living dining area space with two sliding doors to conservatory. Entrance porch with built in storage. Patio doors to rear garden and living room, fitted radiator. Fully tiled, double shower with WC and hand basin. Double bedroom with high quality Dreams fitted wardrobes with radiator. Private garden with synthetic grass with shed.